Saw the movie first and wanted a better look at some of the scenes. Great photography. A little bothered with the comparison of the Titanic to 9/11. The companion to James Cameron's 3-D movie. Full of pictures (before/after the sinking) that help the reader visualize the opulence of this "unsinkable" ship. A moving testimony to the loss of 1,500 passengers and crew members on the Titanic. The photo of the Newfoundland cemetery was especially poignant as some of those who died were never identified. Photographs filmed underwater (in 2001) at the time of the 9/11 attacks on the World Trade Center and the Pentagon. So much attention is given to Titanic, and yet very little time is usually spent on the wreck itself – everyone just wants to see the glamour and drama, not the cold hard facts of decay.The book’s photos resemble that of a crime scene, with constant Before and After, showing what, exactly, the bottom of a Fall looks like after all that vainglorious Pride. This book is basically a printed version of the film documentary "Ghosts of the Abyss". Therefore, from the text point of view it's not that interesting. However, the photos taken to the ship in the bottom are quite cool and make up for it.If you haven't seen the documentary, then this book is totally worth it. If you have, you have tons of pictures here to delight yourself. 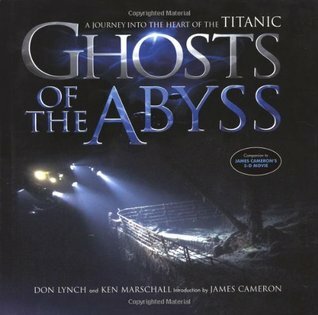 Very good book about the 2001 expedition to titanic with James Cameron. Good with modern and past pictures of the site and ship. I really liked how the book looked. The pictures were detailed and the info helpful. Lots of pictures with some story to go along with it. The history is completely terrifying, but I actually got chills and almost had to close the book from the imagery as well. Stunning but very haunting. This book stirred something inside me that is really hard to explain. A great companion book for the documentary!